A tribunal to try UK Prime Minister Tony Blair and US President George Bush for war crimes will be convened on Wednesday. It is no surprise that neither man will be attending the proceedings - they may not even be aware that it is taking place. 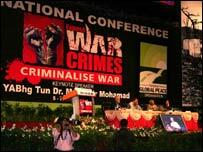 But start it will, at a conference in Kuala Lumpur called as part of the former Malaysian Prime Minister Mahathir Mohamad's campaign to criminalise war. Dr Mahathir is not expected to sit on the tribunal. He couldn't quite be characterised as impartial. 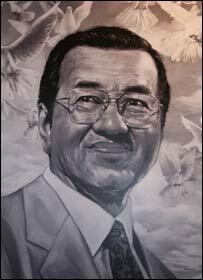 Dr Mahathir said: "What is Blair if not the co-murderer of 500,000 Iraqi children and the liar who told the British that Saddam had WMD (Weapons of Mass Destruction) which could be launched against Britain within 45 minutes? "History should remember Blair and Bush as the 'killers of children'." Although the aim of the conference - entitled Expose War Crimes, Criminalise War - is to outlaw war itself, for many Malaysians who've turned up that means one thing. "They're giving an open mind to people who know what kind of war crime that the US do to our communities in the world," was one man's assessment. It seemed to be that of most people. "It is the converted preaching to the converted," said Gwynne Dyer, a journalist and Oscar-nominated documentary maker who addressed the conference. "But I think this [conference] has potential," he said. "It actually has a goal beyond cheering people up and allowing them to vent." And there's a lot of venting going on here. Specifically it seems to be to vilify Tony Blair and George Bush. The meeting has attracted a curious range of speakers. The former UN humanitarian co-ordinator in Iraq Hans Von Sponeck shares a platform with author Alfred Lambremont Webre. Mr Webre claims to have uncovered a vast conspiracy to profit from wars. He's also keenly interested in intelligent extra-terrestrial life. 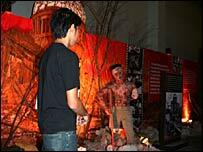 The message is made quite clear by an exhibition staged in parallel with the conference. Its style is Madame Tussauds on a shoestring, and it features tableaux illustrating the carnage of the world wars, the Palestinian problem, Vietnam and of course Iraq. There's a section comprising a cage and a couple of dummies wired up to electrodes with the song Rivers of Babylon pumping away in the background. A helpful notice tells us that the "cheerful" music of Boney M was used as an instrument of torture in the Iraq prison at Abu Ghraib. Dr Mahathir is busy signing autographs. A woman passes him a copy of her programme to sign. "Oh Dr Mahathir", she coos, "you're more handsome in person than you are in photographs." The 81-year-old statesman takes it in his stride. His admirer persists. "I'm honoured, I'm standing in front of you, I'm shaking I feel like I'm in love for the first time," she says. "Shameless flattery," I suggested to Dr Mahathir. "Yes, it's flattery," he said with a grave smile. But there's no flattery when I ask him if he has anything to add about Mr Blair. "What do I have to say about him? I think it's about time he resigns. Don't wait too long, people are impatient. It's time he resigns. He's been telling lies." Not everyone is convinced that Dr Mahathir is a suitable figurehead for a new human rights movement. After all, his record during 22 years in power was far from unblemished. He detained political opponents without trial and had scant regard for the freedom of the press. His administration was accused of turning a blind eye to torture. I put this to Dr Dyer. "If you know someone who has a claim to the moral high ground I'd like to meet him," he said. "Alright, there's one, name a second," he challenged me. "Desmond Tutu," I suggested knowing, I still had the Dalai Lama up my sleeve. "Oh damn," said Dr Dyer. "But you know nobody comes to this with clean hands and if you wait until you have perfect people to do it you're not going to get it done are you?" Meanwhile a Downing Street spokesman responded simply: "We believe the invasion of Iraq was lawful, and we believe that the UN confirmed with resolution 1723 that the presence of the multi-national force remains legal."